Taco Spaghetti - THE BEST! We ate this three days in a row! Ready in 30 minutes!! Taco meat, velveeta, diced tomatoes with green chilies, spaghetti, cream of chicken soup and cheddar cheese. CRAZY good! Everyone cleaned their plates - even our picky eaters! Our favorite Mexican casserole! 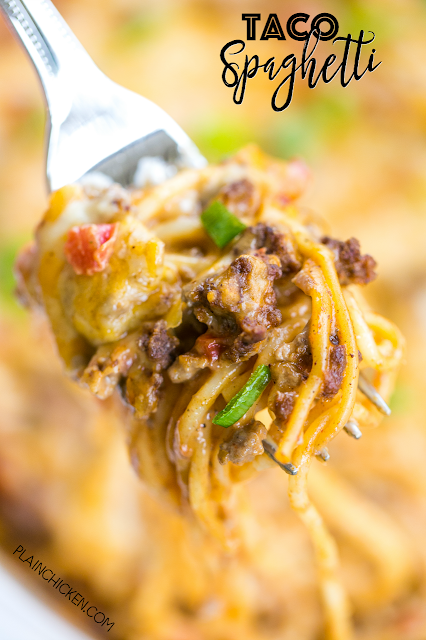 Stop what you are doing and make this Taco Spaghetti for dinner! It is THE BEST! I could not stop eating this casserole. I loved every single thing about it!! Taco meat, Velveeta, diced tomatoes and green chilies, spaghetti, and cheddar cheese. Seriously delicious! We served this with some black beans for an easy weeknight meal! 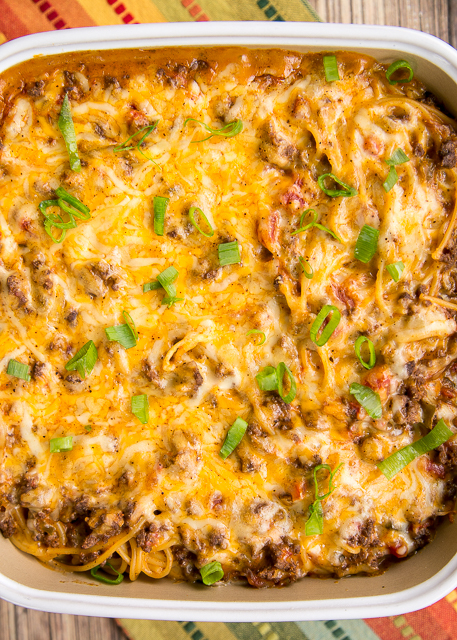 This Taco Spaghetti can be made ahead of time and refrigerated overnight or even frozen for later. We ate this for dinner last week and again for lunch the next two days. It was that good! I just couldn't get enough of it. I am already planning on making this again this weekend! You should too! Can you double it in a 9 x 13 pan for a potluck? How could I modify and make this in my casserole slow cooker? Would it be easier to make this ahead of time and put it on low then warm. Thanks for your help!! I would maybe just add the cooked meat and the sauce ingredients, maybe add some chopped onions and set crockpot on low for a couple or three hours. Probably wouldn't take long, and I would check on it. Then serve over cooked spaghetti. You're basically just heating up a sauce, but you could totally make this ahead of time and even freeze it. Love your recipes and your kitties. Love Meow Mondays! Just made this tonight. Made it on top of the stove. Added everything but the Velveeta. Added some sour cream to the skillet and served it over spaghettii with some cheddar on top. Was no need to bake it. Very yumnmy, and hubs totally loved it. Thanks for a great recipe! Just made this! So delicious! Definitely going to make this again! Thank you for posting!! Do you have to use the velveeta or will just cheddar be okay? I think it needs the Velveeta, but you can make it anyway you want. I just made this for the Super Bowl and all I can say is that I can wait for leftovers tomorrow!!!! So yummy! Thanks for another great recipe Steph! Stephanie - to freeze it do you cook it and then freeze it? I prefer to freeze it unbaked. Could you use Spaghetti Squash in place of the pasta? I have no idea how that would work. Let us know how it turns out if you try it. I am planning on making this for a friend & her family. I like the idea of freezing it so they can bake when their ready for it . Do you know if you can bake this from frozen or should it be completely thawed and then baked? I would thaw it some - it doesn't need to be 100% thawed, but it would take forever if you baked it frozen. If it isn't fully thawed, I would suggest baking it part of the time covered. I am wondering why you used cream of chicken soup instead of a beef type soup or broth? Oh my, now I want this, too! I made this today, it is very delicious, I followed the instructions completely except for adding some sliced mini sweet peppers for color and flavor. My husband will be in heaven for dinner tonight. Spaghetti and taco...PERFECT. Stephanie, This is delicious! I made it for dinner because I needed something quick. Such an easy dish to make. So much flavor! Like my husband said, no changes need to be made to this recipe. We love it! Thank you! SO glad you enjoyed it, Penny! We're a family of 6 and I've only had ONE dish that everyone likes...now I have TWO! My husband went back for seconds and told me to make sure to hold onto the recipe. Thank you!! We're a family of 6 and I've only found ONE dish that everyone will eat...now I have TWO! My husband even told me to hold onto the recipe. The only change I made was using regular diced tomatoes because that's what I had. Thank you!! Just made this tonight and super delicious idea! We had cooked spaghetti noodles to use up and this was perfect, except I was missing a few ingredients and had to improvise. I didn’t have cream of chicken, so I used cream of mushroom, and I didn’t have velvetta or enough cheddar cheese, so I used whatever cheddar cheese I had left (1/2 cup, maybe), and then used shredded Parmesan (maybe 1 cup). After it baked, I topped it with diced avocado and it is perfect ☺️ My picky son (1.5 year old) is also loving it!! my question is that can you make this awesome dish without the cream of chicken soup. Oh yeah! This looks right down my alley. For our tastes, Tone’s Taco Seasoning is the only choice and I might use a spiced Velveeta or add some jalapeños. Gonna deal this one up soon. I made this thinking taco spaghetti? Doesn't "sound" good to me but I liked the look of the ingredients. So? OMG, this is absolutely the BEST casserole. Told a friend about it, she thought same of name but made it anyway. She called and said OMG! WE LOVE this recipe. Just thought I'd find your site, subscribe and let you know we LOVE this recipe!! Has anyone tried this using chicken instead of beef? Making it now...will let you know. Our new favorite casserole.Quick, easy and very tasty. We pair this with ranch beans and it's soooo good. Made this tonight and it was very good! Even my 19 month old devoured it. Only change I made was to cook stew meat down until it was shredding and use that in place of the ground beef as I don't care so much for ground beef. Next time I'm definitely going to double the recipe though because there weren't enough leftovers to eat tomorrow, LOL. Thanks for a great new meal! Looks delicious and I got to try it!! Great meal to prepare in minutes. Definitely going to try this this week. One question though - ny girlfriend hates tomatoes. What would you suggest using in their place? Thank you for the recipe! Im not a fan of chuncks of tomatoes(texture thing) i always put my rotel in yhe blender but will have to reduce your chicken broth some or it will be too runny. GURL! I made this for supper and my family DEVOURED IT! I added a little more pasta, velveeta and spices to make it stretch into a 13x9 since I had 4 teenagers at the table and it was perfect! I don't know what I was expecting but it wasn't that I would be up at 2AM eating the tiny potion of leftovers standing in the middle of a dark kitchen like some junkie. Ha! This is a keeper! I can't wait to make it again! LOL! It is definitely delicious! Glad y'all enjoyed it!! Hi Stephanie I really need your help. I was wondering if you need the cream of chicken soup for the taco spaghetti or can you make it without the soup. I have never made this without the cream of chicken soup, so I cannot say with certainty how it will taste without it. This sounds so yummy...has anyone tried making you in the crock pot?